The Potting Shed015394 32321work01539 433251fax Self-cateringHidden away but in a good location, this pretty, well-appointed property allows you to have the best of both worlds. Walking, climbing, shopping or just relaxing, the potting shed is a haven for all to enjoy. This charming detached property for two will 'tick many boxes' located in a quiet area , just a few minutes' drive midway between both Bowness and Windermere. With walks from the door, year-round lake cruises and all village facilities you will have plenty to do during your stay, whatever time of year you choose. 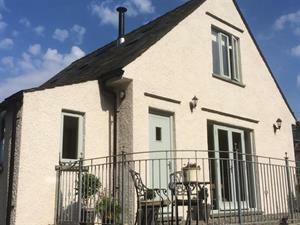 The cottage has been neutrally decorated with carpets throughout, very spacious for two and will be popular with all ages offering an eclectic mix of character and modern with all the comforts of home. Accommodation: Through the entrance hallway with hooks for coats and space to leave your outdoor gear. A well-planned kitchen offers all facilities with cream units and sloping ceiling windows making the most of the light. The light and spacious lounge/dining room has views on to the garden through the double window doors. (wood burning stove, TV freesat, DVD and Wi-Fi). A downstairs wc and basin. Upstairs is a large bedroom with a king-sized bed and there is a separate house bathroom with shower, basin and wc. Furnishings throughout are stylish and comfortable. Neutral colour schemes and attractive fabrics complete the scene. Gas central heating and hot water. Outside: The cottage has its own charming south-facing patio area, garden table and chairs. Parking in next to the property by the railings for one car. The Potting Shed offers weekly bookings starting on Friday. The Potting She offers weekly bookings starting on Friday.